WORCESTER - Three weeks ago, St. Peter-Marian stood at a crossroad. Coming off a shutout loss to Wachusett Regional, Guardians second-year coach Kristen Landers remained positive, but still managed to cast a few doubts concerning the overall potential of her club. Since that day, much of that skepticism has vanished. Following Tuesday night’s 3-0 victory over Shrewsbury at Worcester State University’s Rockwell Field, the Guardians have been on a tear, having now won six of their last seven to improve to 9-4 on the season, and put them one win shy of earning a Central Mass. Division 1 postseason berth. SPM got a strong outing from junior pitcher Jodi Opuda to go along with some timely hitting and solid defensive play. Opuda, a lefty, scattered three hits, keeping the majority of her pitches around the plate throughout the chilly evening. Opuda cut through the Colonials lineup with relative ease, posting four strikeouts as she set Shrewsbury down in order in four of her seven innings of work. She also benefited from some well-played defense, especially that of second baseman Lauren Moran and sister Meg, playing third base. Both combined to make 12 putouts. 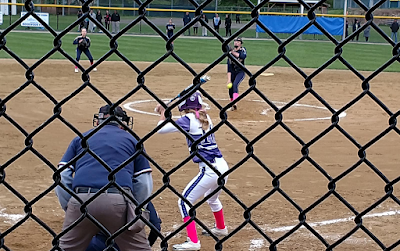 At the plate, SPM jumped on Shrewsbury pitcher Molly O’Neill for a pair of runs in the opening frame. Leadoff batter and Georgetown University commit Deirdre Gallo walked and Inez Herlihy reached on a bunt single. With Colonial third baseman Allison Tocman forced to come in to try and make a play on Herlihy’s bunt, the speedy Gallo never stopped running from first, sliding safely into third. A Meg Moran ground out plated Gallo with the first run. After Carnes was struck by a pitch, Lauren Moran laid down another bunt single to load the bases. Mia Cariglia’s ground out brought Herlihy in with the Guardians’ second run. One inning later, SPM was back at it. Chloe Beland opened with a walk and Gallo, who went 3 for 3 at the plate, lined a single to center. Herlihy’s SAC bunt would advance both runners into scoring position. Moments later, Meg Moran followed with another ground ball RBI before O’Neill (CG, 8 hits, 4 Ks), got Carnes to pop out to keep it a three run deficit. For the remainder of this tilt, O’Neill, a junior, danced her way out of trouble as she kept the Guardians scoreless the rest of the way. For the game, SPM stranded nine runners, including five over the final four frames. With O’Neill finally solving the Guardians offense, on the other side, Opuda continued to dominate. She rolled through the Colonials’ powerful offense with relative ease. Only once the entire game did Shrewsbury (8-5) land a runner beyond first base. That came in the seventh on a two-out double off the bat of Samantha Hallice. But Opuda shrugged the two-bagger off by getting O’Neill to fly out to end the game. All proceeds from last night's game will be designated for the Breast Intentions Massachusetts Chapter, which assists local women who have been diagnosed with breast cancer. This marks the third time in as many years that St. Peter-Marian has staged a game for this charity.